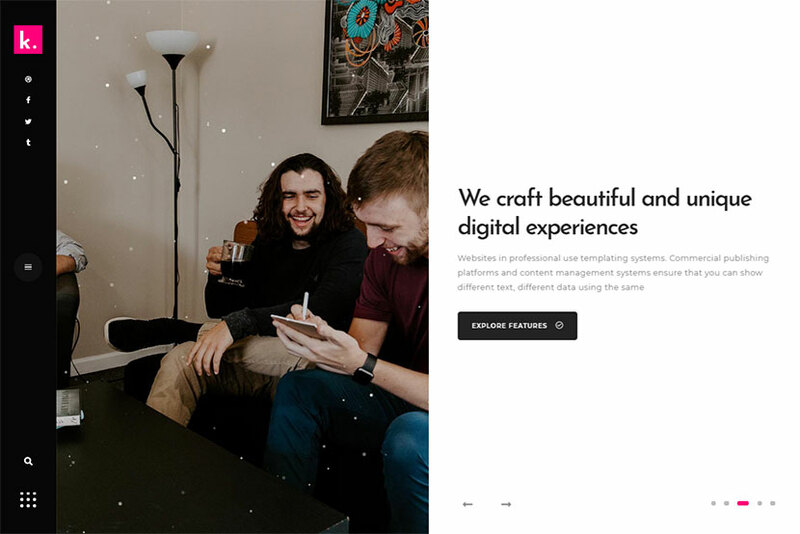 We are happy to present a fresh and awesome collection of cutting-edge portfolio WordPress themes designed especially for freelancers, photographers, artists, agencies, and other creatives. Every theme offers a vast selection of customization possibilities, a number of homepage layouts and portfolio styles, different blog templates, eCommerce functionality, and many more cool features. Check out the themes to choose your best one and enjoy. Zpholio is a WordPress theme perfectly suitable for personal portfolios and resumes of freelancers, artists, designers, and other creatives. 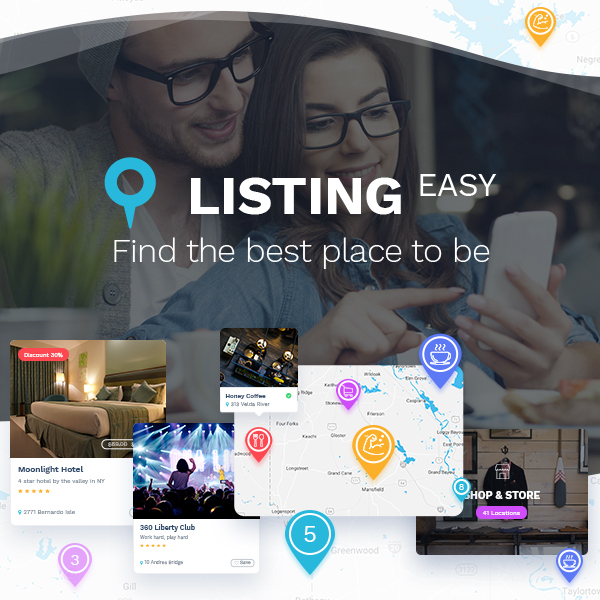 The template comes with 3 homepage layouts, so you can select any style of your front page to impress your potential customers and regular visitors the most. The theme is fully based on Elementor front-end drag-n-drop page builder, so it can be quickly and easily edited without any coding. You can observe the recently made changes instantly. Zpholio boasts 8 portfolio styles to provide you with a wide choice of possibilities when showcasing your works. By the way, you will find several blog layouts, shopping page templates and functionality gifted by WooCommerce support, and many more features. Neron is another cool portfolio WordPress template which will suit for multiple concepts. 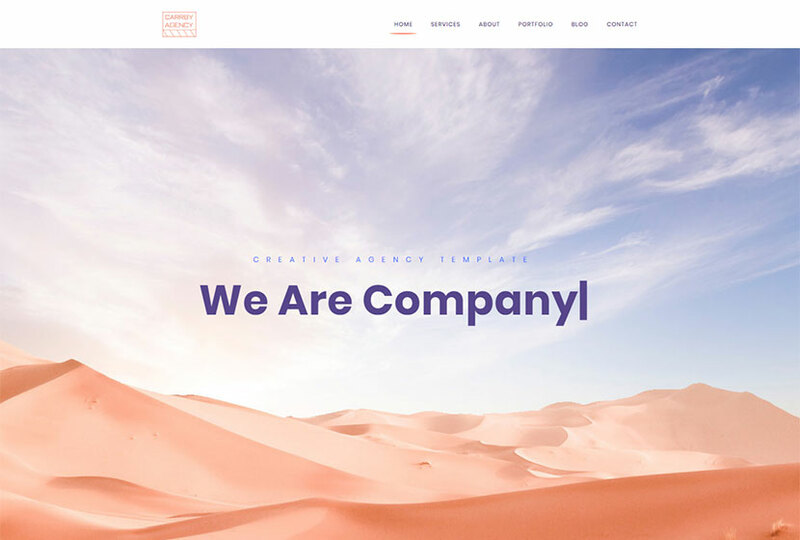 You can pick this theme to use for a website of freelancer, photography studio, creative studio, classic agency, and more purposes. 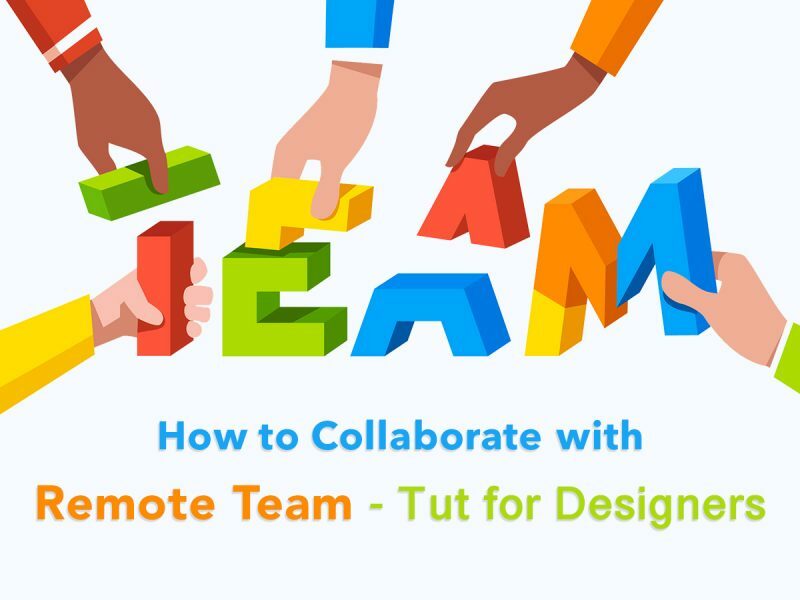 11 homepage layouts will give you a vast choice of styles and designs that meet the most varied tastes. 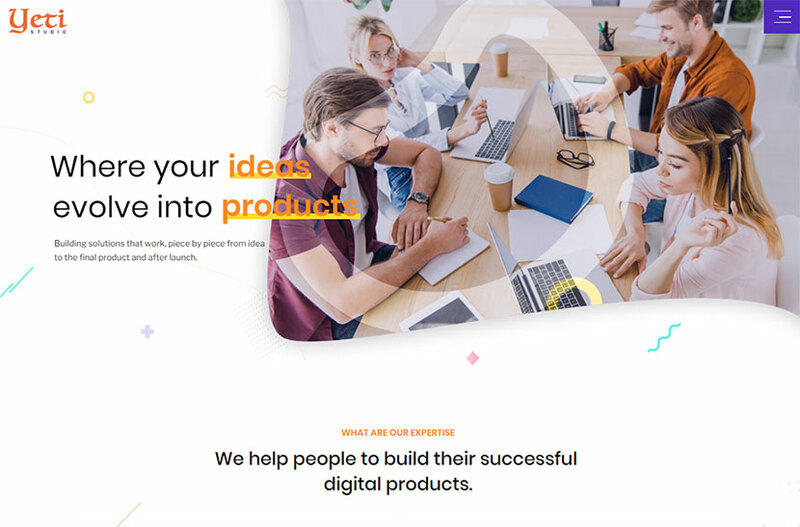 The theme comes integrated with a well-recognized and powerful WPBakery drag-and-drop page builder, so you can easily build your pages focusing on your work and not your coding skills. Powerful theme options, rich blog features, smooth parallax, 12 pre-made headers, shopping functionality, animated icons, and many more features are available. 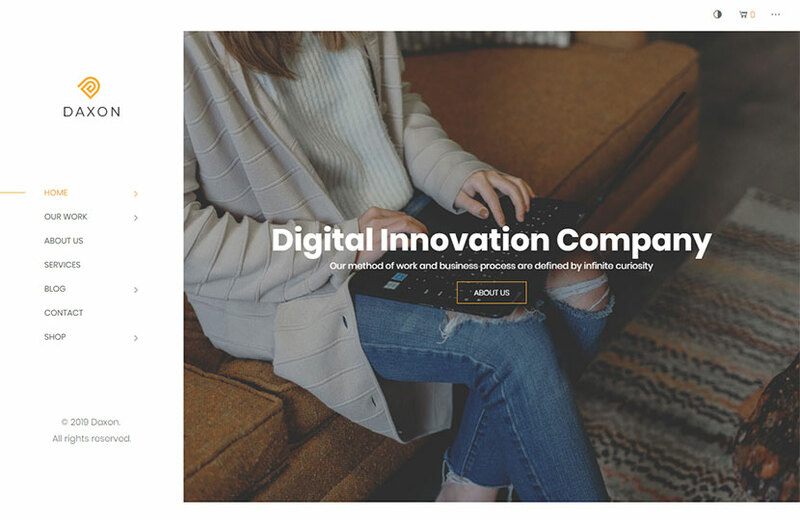 Daxon is one more cool agency and portfolio WordPress theme which comes with modern design with sidebar menu as well as 5 homepage templates suited for agencies, startups, portfolios, photography, or any other related purposes. You can customize every homepage to adapt it to your custom needs and preferences. The template is built on WPBakery page builder plugin, comes with powerful admin panel providing great possibilities of customization, parallax sections, fontawesome icons, RTL languages support, smooth CSS3 animations, Revolution Slider integrated, Contact Form 7 pre-packed, unlimited color options, Google map, XML sample data included, Bootstrap 4 options, and many more features. Another modern and beautiful agency and portfolio WordPress theme which has unique design and comes with light and dark homepage styles as well as blog demos. 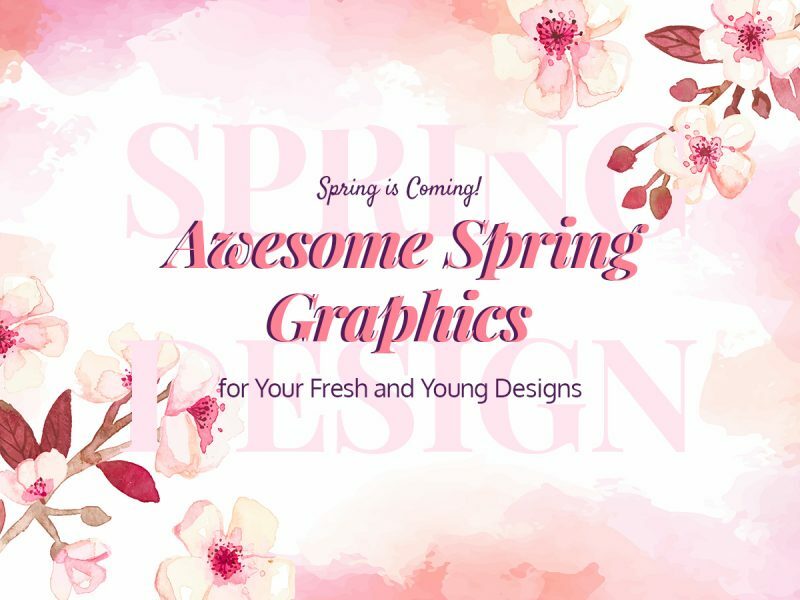 If you are a creative and need to build your worthy online presence to showcase your works to potential clients, this template has you covered. 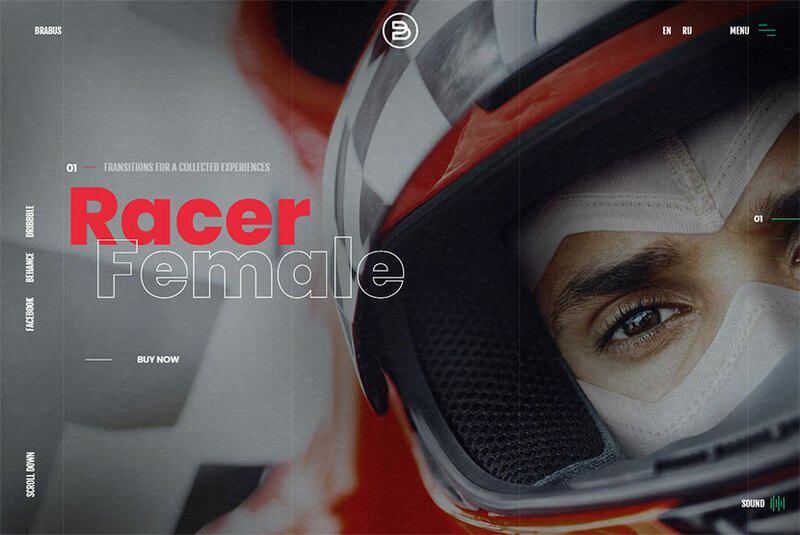 The theme supports different types of layouts including a text and image slider, a text slider, one-page and multi-page versions, curve and plain styles, video header, and more. It includes a bunch of pre-made inner pages like Portfolio details, Service details, blog list, filterable portfolio, and more. It also comes with some premium plugins including Contact Form 7, and contains Boostrap 4 based options, as well as many more useful features. 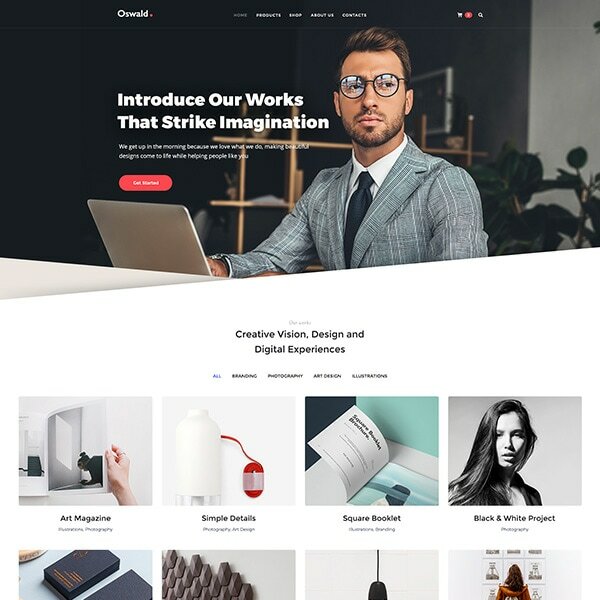 Klen is a creative portfolio WordPress theme which is going to suit for designers, agencies, personal portfolios, architects, freelancers, photography studios, musician or painter portfolios, artists, artworks, etc. The template comes with 4 homepage layouts with masonry and carousel variations of content display. 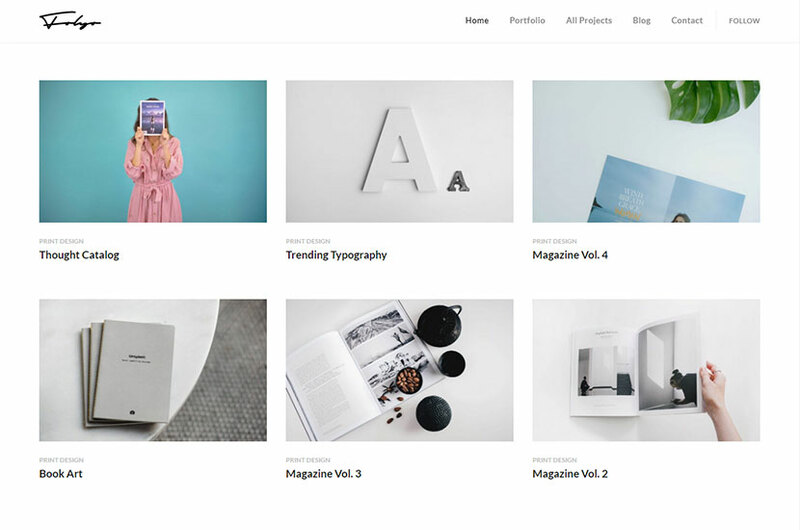 This theme is Gutenberg optimized and includes custom blocks like page head, reference, separator head, single image, multiple image, single content, item content, and more. It includes Redux framework based features, Contact Form 7 plugin, 2 header menu styles, smooth scroll, ajax load, easy customization, creative design, and many more advantages and possibilities. Brabus is a contemporary portfolio WordPress theme especially designed for agencies but also suited for freelancers like photographers, writers, designers, developers, or other creatives. It comes with a beautiful fullscreen slider, animated pre-loader section image, slider noise effects and audio for hamburger. The theme supports multiple languages, comes with portfolio boxes available, pre-defined inner page header, hamburger menu, content blocks, svg images, beautiful typography and Google fonts, wireframe project user-friendly interface, wow scroll animations, ajax PHP contact form, animated portfolio thumbs, header fade effects, and many more features. Newman is a portfolio WordPress theme which will also suit for video and blog websites. This means that you can use it for a video blog, digital agency, photography studio, restaurant, fashion, creative agency, wedding planner, or any other purposes and portfolio type websites. 12 homepage layouts are available with Newman, and each of them suits for a different concept. Features of the template include the in-background media playing, hero header builder, body page builder, global and local footer builder, a tremendous amount of Google fonts, revision history, contact form builder, save-reuse templates, fullwidth and sidebar page layouts, multiple header types, one-click demo import, and many more advantages. One more creative portfolio WordPress theme designed for a multitude of purposes. This means you can use its 3 homepage layouts for a number of concepts life agency, portfolio, freelancer websites, and more. 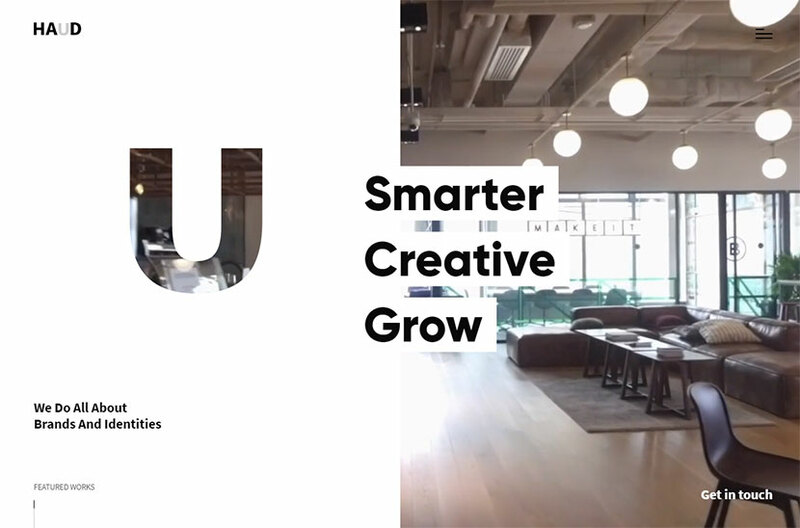 Creative, single and portfolio demo types each include 6+ variations of concepts like startup, creative agency, portfolio, event, studio, etc. By the way, certain homepage types contain different layout variants like hover grid, glitch links, parallax slider, video, etc. The template comes with the King Composer page builder, Kirki Customizer with multiple options, advanced custom fields, Merlin WP theme setup wizard, visual portfolio, MailChimp compatibility, Contact Form 7, isotope filtering, blog layouts, Swiper Slider, GreenSock animations, Google fonts, fontawesome icons, and many more features. Yeti is one more portfolio WordPress template which comes with 2 homepage layouts with trendy design as well as comprehensive functionality. 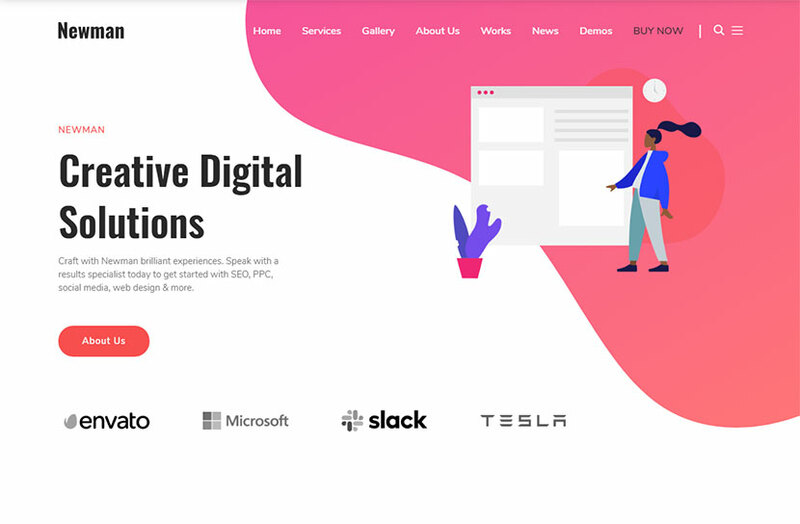 This theme is quite appropriate for creative agencies, photo studios, freelancers, startups and some types of businesses that require an online portfolio for promoting and showcasing their works. The template is based on Elementor front-end drag-and-drop page builder, so it is easy to edit without any coding. It is compatible with Gutenberg content editor, contains fontawesome icons, pre-configured inner pages, unlimited color schemes, several header and footer layouts, WPML support, powerful theme options panel, the possibility to create custom sidebars, and many more features. This is one more creative WordPress theme which is going to fit for building online portfolios and comes with 3 homepage templates to choose from. 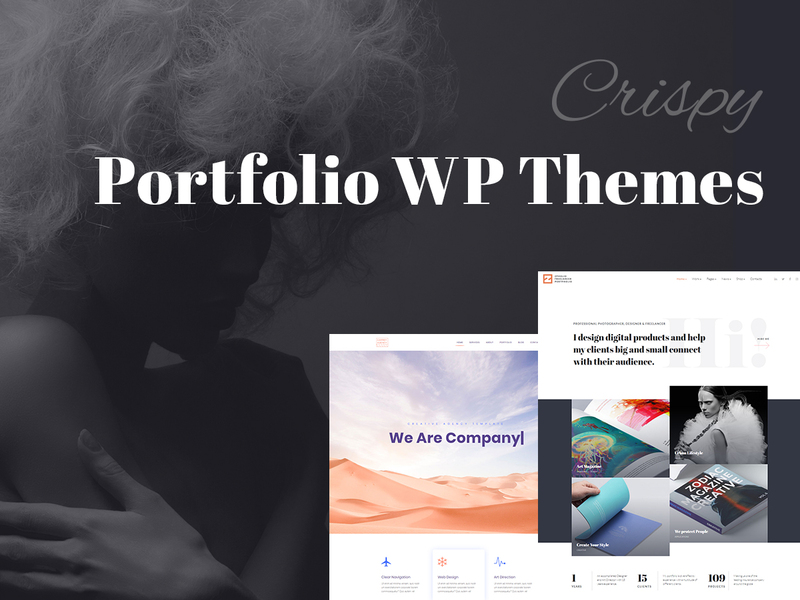 It includes 6 pre-defined inner pages like About Us, Services, Client’s Opinions, and more as well as a bunch of portfolio templates including a portfolio single layout variant. Numerous features of the theme suppose WPBakery page builder integration, Revolution Slider, powerful options for shortcodes, WooCommerce support, unlimited color options, multiple headers and footers with options, advanced admin panel, WPML localization compatibility, Contact Form 7, Bootstrap 4 based options, grid, standard and minimal blog layouts, and much more. Another awesome and creative portfolio WordPress theme which has the split screen homepage design with video playing at the background. Mei, Lolai, Deep Keep, Lifecast and On Keeper split screen layout variants make this theme really unique and original, and hamburger menu which opens as an interstitial ad and covers the whole page, focuses the attention of users on menu items. Features of Haud suppose unique and creative design, video slider, cool effects, svg shapes, original layout, CSS3 content animations, easy customization, free Google fonts, and much more. This WP template is going to become a top-notch solution for building your online portfolio and showcasing your best works on the Web. 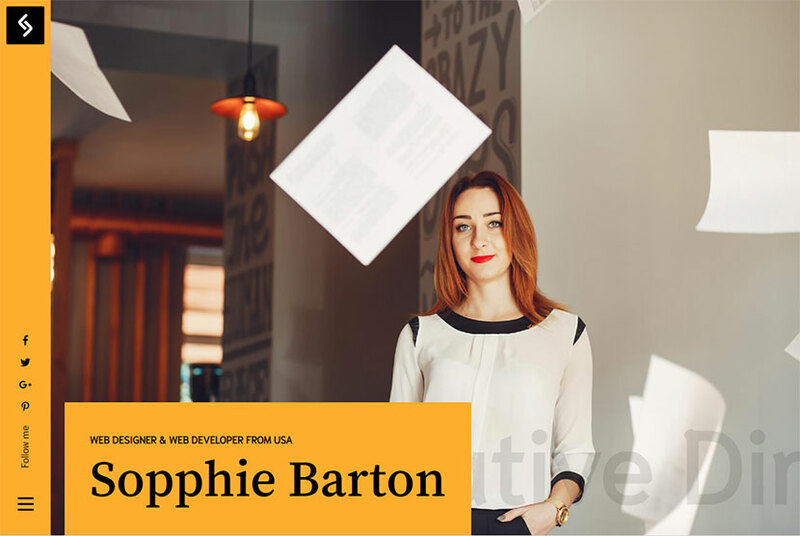 Sopphie is a creative personal WordPress theme which is going to amazingly fit for building your web portfolio and presenting your works to visitors and future customers. It comes with 4 homepage layouts including a background video, hero image, packery and grid, 5 portfolio layouts like packery, grid, carousel and two types of interactive links as well as a blog layout pre-packed. This template is suitable for freelancers and comes integrated with WPBakery drag-and-drop page builder, RTL and WPML support, MailChimp compatibility, powerful theme options, Bootstrap 4 based options, fullscreen menu, child theme included, 5 header styles and 3 footer styles, one, two and three blog post columns, 4 custom widgets, advanced typography options, and many more features. 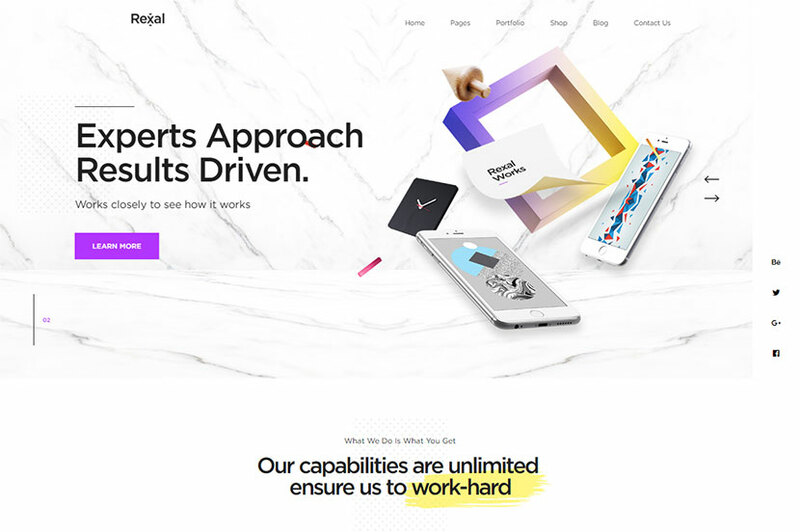 Rexal holds itself out as a colorful and modern multipurpose portfolio WordPress theme. It suits for SEO and digital agencies, freelancers, artists, photographers, and more creatives. The template has 11 various homepage layouts including one-page and portfolio styles, so you get a vast choice of possibilities when it comes to building your influential online presence. King Composer page builder, Revolution Slider, WPML translation ready support, advanced typography options, Contact Form 7, powerful framework, bottom footer widgets, unlimited sidebars, pixel perfect design, advanced admin panel with multiple theme options, fullscreen background slider, custom widgets and shortcodes, wide and boxed layouts as well as many more features come with the theme. 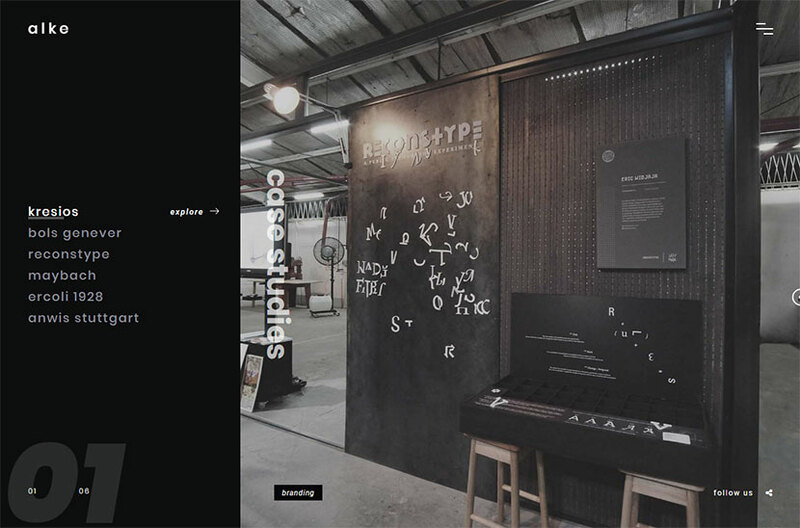 Alke is a minimal and creative portfolio WordPress theme available with beautiful dark skin as well as a few homepage templates like kresios, bols genever, reconstype, maybach, ercoli 1928, and anwis stuttgart. Its fullscreen menu with huge menu items covers the page when opened and captures the overall attention of a user. The template is integrated with WPBakery drag-and-drop page builder with 19+ custom web elements for creating unlimited pages, limitless color styles with the possibility to create a custom color scheme, advanced WP Live Customizer with a number of options, menu letter effects, translation ready support thanks to the .pot file availability, parallax effects, smooth scrolling, CSS3 animations, and many more features. Folyo is a modular portfolio WordPress theme which has the custom built-in modules pre-packed. It includes 5 homepage layouts with different unique design styles, a wide selection of portfolio types like stacked right, fullscreen hero slider, large images, and more, All Projects layout with different number of columns, and a pre-defined blog template in the pack. All modules included into the theme are fully customizable, so you can create your pages and layouts with ease and up to your taste. Live Customizer settings, custom widgets, hero selection, sticky, transparent and other header styles, mega and drop-down menus, gallery video and audio formats, great typography, parallax effects, translation ready support, and many more features are available. More collections are around the corner. Stay tuned.